Hi Katie! I am Duygu from Turkey and i'm your very very big fan since before started writing my blog. I adore your hair, style and i think you're so pretty. Actually i was posted one of your hair tutorials with a link i hope you will not be angry. :) Recently i started to translate my posts to English because my follow list is full of blogs written with English language :) a beautiful mess. maegan etc... I don't have kids right now, it's in our future plan of course and i hope i would be like you :) If you like to follow this is my blog. Kisses and have a nice day! Thank you so much for such sweet words! I'm off to stop by your blog! Hello! 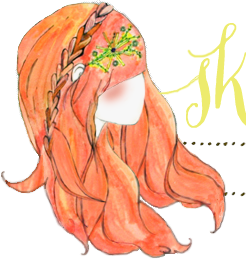 I just happened across this wonderful blog and I love all of your cute creations and style! Where, if I may ask, did you get the cute blue romper on this page? !